New ongoing episodes are published every other Monday...so stay tuned to find out what happens next! 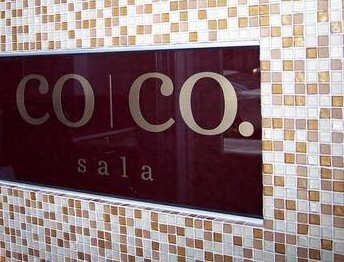 Cindi and I had been on the phone all week salivating over the possibility that we would be meeting for dinner at the new place on F St., NW – Co Co. Sala for our usual divas night out. The restaurant provided mini-meals but the main draw was their artisan chocolate desserts and pastries and the variety of chocolate-based drinks. Jaz was out of town with her students at Duke Ellington. They were on their annual summer trip to New York to watch a Broadway play. There was nothing exciting or enticing about hanging out with fifteen hormonal 14 year-olds in New York all weekend. This scenario conjured headaches and anxieties forcing me to brush away the frightful thought with last minute work issues. I was running late as usual and it did not help that early-bird Cindi was certain to be on time tap-tap-tapping her feet as she stood outside for a smoke before I arrived. Thank goodness for the smoking indoor ban in DC-I literally breathed a sigh of relief when that law passed…no more smoke filled hair after a night of drinking and debauchery. I finished the contract I had been drafting all day. While walking towards the elevator I heard the uncanny hiss of a run in my stockings creeping up the side of my leg. Damn it! The stockings with a hint of purple were part of my “look” as they went perfectly with my Tory Burch Betty pumps and my What Comes Around Goes Around Tamara dress. And I hadn’t even shaved my ashy legs in over a week. Not a diva divine moment! Since I knew I did not have any fr#$%king lotion I would have to remove the torn stockings and just try to buy some lotion on the way to the restaurant. I was in a rush so I turned around and did not see anyone else in the elevator bank. As the elevator appeared I stepped in quickly and tried to remove the unexpected “glitch in my plans” when I looked up and there was Jerry. Crap! I snapped my head back and looked at him eyes wide open. Crap again! Was my dress hiked up too high? I wondered to myself. This was not what I wanted to happen at that moment. Seems like every Friday there was an embarrassing moment between the two of us. He cleared his throat. Geesh! At least this week I was not puking down his shirt after drinking too much and tripping in front of my co-workers. He held unto his briefcase, pressed the lower level button and did not say anything to me. Hmmm…wonder if it’s time to start searching for a new job. I thought as I lowered my dress. As expected, Cindi was outside with cancer stick placed firmly in mouth. She was once again wearing her work “uniform”. “What’s up with your legs?” she noticed wrinkling her upper lip as I approached. “Do you have lotion? I am going to scavenger in the restroom for some.” I retorted. Thankfully the restaurant was dark on the inside. As we stepped into the restaurant not only was the rich earth colored, modern tiled kitchen inspired bar décor and chic lounge fantastic but also the 6’1”, hot, fine as hell guy at front table who we assumed was the host. He looks at us and says, “You two are the lovely women who were at Lima two weeks ago. How are you doing?” Huh?! He remembered us. <jaw drop> I could not even remember seeing him. “Yes! We were there it was so crowded that night.” Cindi saved the conversation…thankfully. He took us to our table and proceeded to let us know what his favorite drink was on the menu. He came back again when we were ordering our meal and this time he let us know his favs were the classic macaroni and cheese as well as the Goat Cheese and beet salad and then he handed both of us his business card. Quick glance – he was the manager of this and a few other restaurants…even more fascinating. Dinner was amazing and as we were about to leave he looks at us and says that we should call him next time we decided to stop by. As we stepped outside, Cindi squealed “I think he was looking at you when he said that.” I was taken aback since she was usually the male magnet and I was never able to find the lotion so I was not my usual confident best. Either way I can sometimes be oblivious to when a guy is paying attention to me. I think as of next week he and I will become email buddies. This is so engrossing. I am not 6’1, but I do like the successful lawyer type. So tell, me diva, do you have a boyfriend? I like to cook and give foot massages (but you’ll have to work up to the foot action). Are your friends based on actual people. I have lots of friends looking for fine women (even not so fine if they’re easy). Keep Forgetting to Read the Latest Episode Every Other Monday…Subscribe via email! Diane Weisberger: Narrator. Drama prone. Consultant. 30 years old. Straight forward. Jewish. Bi-racial. Grew up in Boston. Cindi Alexander: Attorney. Conservative. 30 years old. Likes to stay within the four corners of her box. Caribbean. Grew up in Brooklyn, NY. Jasmina "Jaz" Rodriguez: Part-time dance teacher. Part-time actress. 29 years old. Healthy. Quirky. Fun-loving. Cuban. Grew up in Miami. 1: Let them see you sweat. 2: Allow work drama to keep her down. 3: Not live life to the fullest. 4: Not support her girlfriends. 5: Miss an opportunity to shine. 6: Not share dating details with her best girls. 7: Change who she is for a guy. 8: Lose her cool in public, especially in front of people she does not know. 9: Not do all she can for her friends. 10: Not look out for her girls. 11: Sacrifice her dignity on behalf of a relationship. 12: Let a guy misuse her. 13: Sweat the small stuff. 14: Miss girls-day-out. 15: Be afraid to have fun. 16: Let age set her back. 17: Pass up a day of relaxation. 18: Let her best girl celebrate her birthday by herself. 19: Get frazzled in a sticky situation. 20: Never let them know that you look fabulous on the cheap.